Consider this a friendly reminder: One of Uniworld Boutique River Cruise Collection’s newest and most unique river cruise itineraries is now open for booking. Dubbed India’s Golden Triangle & the Sacred Ganges, this 13-day itinerary traverses the exotic and complex country of India – one of the first of its kind to be offered by a North American-based river cruise line. Debuting in January 2016 aboard the newly-built Ganges Voyager II, this is the river cruise for those looking for something far removed from the ‘ordinary’ voyages along the Danube. Sailing on the Ganges River, Uniworld’s India’s Golden Triangle & the Sacred Ganges whisks guests to the some of the most revered and culturally-rich areas of the country. 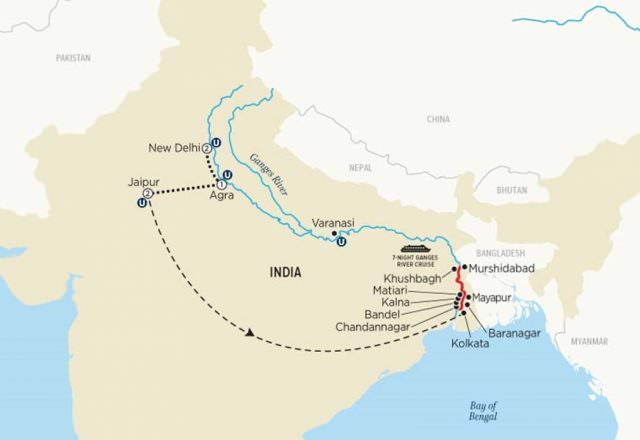 This is the real deal: a full immersion itinerary that combines a weeklong voyage aboard the Ganges Voyager II with five nights spent on land in exquisite Oberoi Hotel properties along the way. 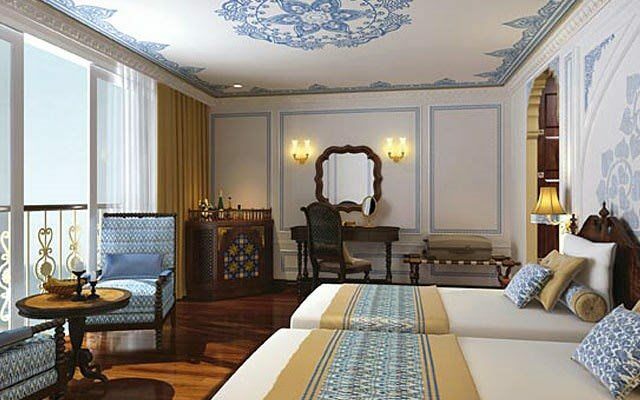 Headquartered in Delhi, a stay in an Oberoi Hotel is the perfect complement to the unique and exacting onboard atmosphere that Uniworld cultivates for each and every river cruise. The line is, after all, part of The Travel Corporation group, which also owns the highly-acclaimed Red Carnation Hotels. Day 1 New Delhi A Uniworld representative will greet you at the airport and transfer you to the regal Oberoi New Delhi hotel and resort, a luxurious retreat tucked away in the heart of India’s cosmopolitan capital. Day 2 New Delhi Spend your first full day in India getting a panoramic overview of the city’s top sights, including the two-toned sandstone and marble Red Fort, which served as an imperial citadel until the last Moghul emperor was exiled. Stop to visit Humayun’s Tomb—inspiration for the UNESCO-designated Taj Mahal—and Raj Ghat, a black granite memorial to Mahatma Gandhi, India’s beloved father of independence. Day 3 New Delhi / Agra Transfer to Agra via a newly built expressway, and check in and enjoy lunch at the spectacular Oberoi Amarvilas. Later, visit one of India’s most majestic forts—Agra Fort—a palatial walled city containing russet sandstone buildings encircled by a deep moat. as incredible as the tomb itself. Commissioned by the broken-hearted Emperor Shah Jahan after his beloved wife died in childbirth, this masterpiece of Islamic architecture took some 20 thousand laborers and artisans nearly two decades to complete (at a cost of more than $1 billion in today’s money). Your first glimpse of the Taj Mahal—perfectly timed to coincide with the setting sun—will literally take your breath away. Day 4 Agra / Jaipur Venture back to the Taj Mahal at sunrise, when the pristine white marble monument is aglow with the soft pink luster of dawn. Seen in the magical first light of day, the graceful, dream-like Taj will forever linger in your memory, the sunrise you will henceforth compare to all others. You will learn more about the mausoleum’s fascinating history, perfect proportions, precious building materials, and intricate craftsmanship. Enjoy some free time before returning to the resplendent Oberoi Amarvilas resort for breakfast. Transfer to Jaipur, the magnificent capital of the Indian state of Rajasthan, where you will check in at the beautiful Oberoi Rajvilas and relax over lunch at the hotel. If you wish, you may take a complimentary shuttle into town and make your initial foray into the city’s colorful bazaars. Day 5 Jaipur Your tour of the romantic Pink City of Jaipur includes the residence of the former royal family—City Palace—a sprawling complex with lovely courtyards and gardens. You will also visit the UNESCO-designated Jantar Mantar, a centuries-old observatory housing the world’s largest sundial and a superb collection of astronomical instruments. Enjoy views of the nearby Hawa Mahal, with its multitude of windows and ornate façade, designed to resemble Lord Krishna’s crown. Relax during the afternoon or take a complimentary shuttle into town to explore the city’s bazaars, which are overflowing with high-quality textiles, jewelry, gemstones, and richly embroidered leather jootis—traditional Rajasthani shoes. Day 6 Jaipur / Kolkata / Embark Ganges Voyager II Transfer to the Jaipur Airport and fly to Kolkata, India’s second-largest city, a clamorous yet captivating metropolis situated on the Lower Ganges. Before boarding your elegant all-suite ship, you will visit Mother Teresa’s former home, where the late Roman Catholic nun established the Missionaries of Charity in 1950. See her humble tomb and the room where she lived for 44 years, as well as an exhibit highlighting her life and work. You can also pay a visit to a nearby orphanage operated by the Missionaries of Charity. Cap off the day with a Welcome Dinner, followed by a cultural performance onboard the Ganges Voyager II. Day 7 Kolkata / Bandel The former capital of the Raj, Kolkata offers intriguing glimpses of the “old India” of the British colonial period, including grand architecture such as the Writers’ Building, High Court, and General Post Office. Observe these and other key sights on your city tour, plus visit Kolkata’s oldest Anglican church and the Victoria Memorial Hall, a museum boasting India’s largest collection of colonial artifacts. Return to the ship for lunch and a scenic cruise that passes a number of former colonial settlements. Later, take an excursion to Bandel to visit Hooghly Imambara, a mosque that’s a triumph of Bengali architecture. Day 8 Kalna There is no better way to see the sights of Kalna than via an exhilarating trishaw ride through the heart of the city. Kalna’s Rajbari complex has the region’s densest concentration of temples, including 108 intricately carved, slope-roofed structures devoted to Shiva, the Hindu god. Walk back to the ship, perhaps stopping at the bustling local market on the way. Day 9 Matiari Enjoy a walking tour of Matiari, an artisans’ village revered for its finely wrought brassware, and venture inside a local home to observe master craftsmen at work. If time allows, you may also have an opportunity to learn some of the nuances of the game of cricket—India’s favorite sport. There will also be time to shop for village-made goods at a small riverside bazaar. Back onboard, roll up your sleeves for a mehndi demonstration—intricate henna designs typically painted on the palms of women’s hands to attract good luck. Day 10 Khushbagh / Baranagar / Murshidabad Begin the day with an early morning stroll through the farmers’ fields of Khushbagh to a well-preserved complex built by one of the region’s former colonial-era rulers. Return to the ship for breakfast and a brief scenic cruise to Baranagar, a village with many ornately carved sandstone structures and temples dating back hundreds of years. Take a leisurely walk to absorb the rural atmosphere and a pace of life that is decidedly slower and less complicated. Enjoy lunch back onboard the ship as you continue downstream to the fascinating city of Murshidabad. As you round the river’s bend, a most unexpected sight unfolds before you, an echo of an era long past—the massive Hazarduari Palace, famous for its thousand doors, both real and false, and its fine collection of antiques and British colonial artwork. Climb aboard a horse cart for a lively ride to Katra Mosque, one of the largest and most interesting in the region, before returning to the ship. Indulge in a lovely dinner followed by the evening’s entertainment—a spirited Bollywood-style show with music and dancing. Day 11 Mayapur After a scenic morning cruise, visit the welcoming and wildly colorful village of Mayapur, birthplace of the founder of the Hare Krishna movement. One of India’s top pilgrimage sites, Mayapur is headquarters for the International Society for Krishna Consciousness (ISKON), and millions of scholars and devout followers visit here every year. The village is also home to hundreds of second generation Hare Krishnas born to North Americans and Europeans who relocated to India back in the 1960s. Dominating the skyline is the dome of a colossal Vedic temple, largely funded by the great-grandson of Henry Ford. Once completed in 2016, the temple will be twice the size of St. Peter’s Basilica in Rome and large enough to accommodate 10 thousand worshippers. Day 12 Chandannagar / Kolkata A French colony for 275 years, from 1678–1950, Chandannagar is a fascinating place to visit because its cultural heritage and character are so very different from the rest of India (most of which fell under British rule). The city is situated on a crescent-shaped bend of the river, views of which are best admired on a leisurely stroll along the Strand, Chandannagar’s waterfront promenade. The Strand also features many lovely colonial-era buildings that have stood the test of time, such as the former French governor’s residence and the Roman Catholic Sacred Heart Church. after the colonial rulers left India for good. Spend your last evening onboard enjoying a Farewell Dinner. Day 13 Kolkata Disembark the ship and transfer to the Kolkata Airport for your return flight home, or fly to Varanasi for a 3-day optional extension in the holiest city on India’s holiest river, the sacred Ganges. 5 nights in luxurious Oberoi Hotels & Resorts, including daily buffet breakfast and all service charges, taxes, and porterage. Onboard cultural enrichment, including traditional sitar music, a Bollywood-style song and dance show, and more. 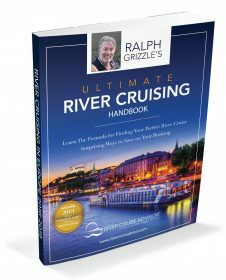 With river cruise journeys that already explore some of the farthest reaches of Russia, China, Vietnam & Cambodia – not to mention nearly all of Europe, including Italy – these Indian river cruise journeys are likely to fit right in with Uniworld’s existing offerings. They’re also likely to book up fast. Booking earlier is definitely better than later as far as these itineraries are concerned! 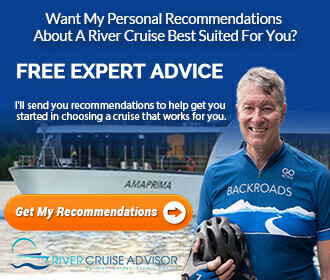 More information on Uniworld Boutique River Cruise Collection can be found by viewing our company overview here on River Cruise Advisor.